Ski shuttle buses provide cheap transportation and transfers from Geneva Airport (GVA) to many winter sports resort in the French Alps. Shuttle buses provide the cheapest transfers and transportation from Geneva Airport (GVA) in Switzerland to the top ski resorts in the French Alps. Some of the major routes with regular bus services are listed below. These buses operate mostly during the ski season only. Private transfer services are also very popular especially for small groups and families. Early reservations are especially important over weekends with Saturday by far the busiest day during the winter. It is worth comparing prices as offers by various shuttle bus providers differ widely. Taxi2Airport and Suntransfers give easy online quotations.without requiring personal information in advance. See Snow Shuttle Buses from Geneva Airport for a general tips and a list of all destinations directly served from Geneva Airport. During the winter ski season, four different companies offer regular shuttle services between Geneva Airport and the winter sport resorts in Chamonix. Traveling time from Chamonix to Geneva Airport is 90 minutes to two hours. Prices range from around €20 to €30 one-way with returns sometimes giving a small discount. Generally prices go up as bus size and the number of stops en route go down. Alpybus and Cham’Express have the largest number of buses on the Geneva Airport to Chamonix route and at busy times have airport shuttles as frequent as every half an hour. Private transfers are also possible. Société Alpes Transports (SAT Mont Blanc) and Veolia Transport Suisse Tourisme operate five buses per day between Chamonix and Genève Aéroport (GVA). To Megève: Borini has three buses per day between Geneva Airport and ski stations in the Mont Blanc area. From Geneva Airport, these buses need an hour to Saint Gervais, 1h15 to Combloux, and 1h30 to Megève. Reservations are required. Alpski has three daily buses from Geneva Airport to ski resort in the Tarentaise region of France. On Saturdays, up to seven buses are available. The ski season here is long with buses running from early December to mid-April. Aerocar runs five daily buses between Geneva Airport, Crolle, and Chambéry. 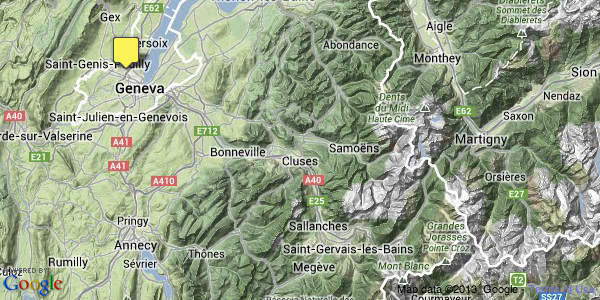 Altibus has connections to virtually all ski resorts in the region from Chambéry (e.g. Albertville, Moutiers, Aime, Bourg St Maurice, Modane) and Grenoble (Alpe d’Huez, Les 2 Alpes, Serre Chevalier, and Villard-de-Lans.